If you visited Paris, you probably noticed what we call the "Roms" (Gypsies), that is an ethnic group who originates from India and who settled down mostly in Eastern Europe. They are very poor and not really welcome anywhere (including their home country) but with the opening of the EU borders a lot of them emigrated to the West, including France. They are now in the middle of a political battle as the government is trying to send them back to where they are from (Romania mostly) and the opposition is accusing the Government of being inhuman. This is a scene I see nearly every day and I'll never grow accustomed to it. The homeless, the gypsies, the beggars, these continue to be challenges, distinct but overlapping, even in modern, 'civilized' societies. As the economy suffers, these challenges grow. We're seeing many more beggars in Minneapolis. The aid organizations have recommended that people should give to organizations such as the Red Cross, food shelves, etc., instead of giving to the individual beggars. You might think this is a selfish statement by the organizations, but the thought is that the money goes farther and is better used when combined with other money and resources. It is a difficult choice. Don't ever stop reminding us, Eric, with these photos. 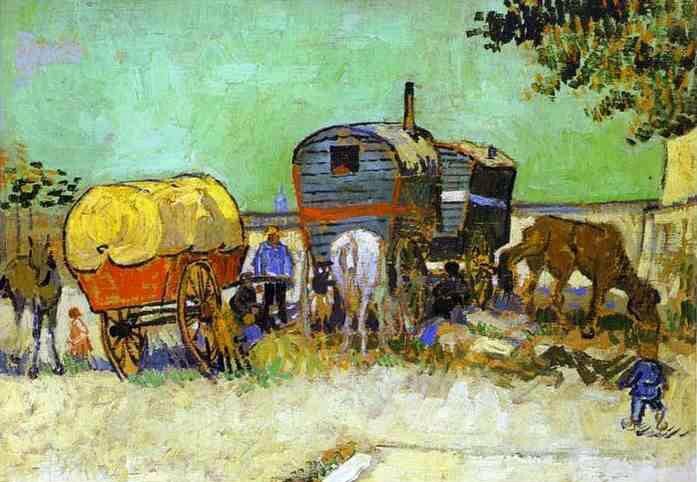 A far cry from Van Gogh’s Gypsy Camp Near Arles. It is disturbing when an entire group or race of people is singled out for persecution, be it Jews, homosexuals, or Gypsies. Who will be next? All homeless? The merely poor? The middle class? Are we really heading for a New World Order, a kind of post-industrial feudalism with Sarkozy and his ruling-class cronies reigning supreme? One can imagine that outside the frame of this photo there are opera goers passing this woman by, ignoring her or regarding her with contempt: Opera goers on the way to a performance of La bohème. I doubt this woman gets much money from passersby, and most likely NO smiles. I have sympathy for the Rom, who are so universally unloved—unless they use their children, of course (and I have to wonder what the men are doing since it's always the women you see begging on the street). That's a good point, Alexa, that it is the women who are begging. We have homeless here of course but I don't think we see them begging for money and sleeping openly in the streets as much as in Paris. Here in my city, we have so many shelters that provide food and a bed overnight. I have no idea how much of that is common in Paris.I've also seen men with children sitting in the streets begging there as well. What is the answer? I think there is no good solution. Call me inhuman if you like, but I support the decision of the French government. There are limits of tolerance and good will. I do not like gypsies because they do not assimilate and do not work (never ever had) - begging is not my definition of work. I see them strolling around the city with no particular purpose, waiting for ... I do not know what. Beautiful shot in B&W. In colors as well as in real life, when we pass by one of these women, children or men (yes, men too, but it is rarer), the photo is less beautiful to us, isn't it? ....I was hoping for a pretty picture but I see life in today's PDP...tough issue to understand if you are not Roma or French.....interesting fact; the sign is two sided, total marketing exposure. Just to clarify: I just received an email saying that I was generalizing and that all Roms are not poor. It is true of course, I should have written "most of them are very poor", but of course, you will find rich Roms. While living in Paris, I noticed that the beggars do not confront you, but merely sit and wait for charity. In the US they seem far more aggressive and sometimes follow you down a street. I also saw a mother and teenaged son run up to a spot on the curb on rue Cler and then she sat in her pose and the boy started to hobble around next to her. A real act - I wonder just how many are acts!? I've read about this and the issue seems to be a divisive one. I haven't done enough thinking on the subject to know which side of the debate I would support, for at this point I can see both sides. Either way, it is just plain sad. A very good reminder for us, Eric. Reality, as opposed to "tourist" images, always present a confrontation, often without simple solutions. Please do not buy into easy generalizations. There are many incredible gypsy musicians appearing on the streets and in clubs in Paris, making a living. A quick note - as this is the first time I've been able to check in for weeks - I just read your post about the passing of your Aunt, Eric. I want to send you and she and your family all my prayers for peace. It was a lovely and heartfelt post. I send my best out to Tonton Flaneur and family, too. My mom just suffered a stroke and it's such a blessing to have her. May we all find peace with what's given to us - no matter how it comes. I add my heartfelt condolences along with Carrie's on the loss of your aunt, Eric. Last week there were reports on several European radio news broadcasts as well as on US NPR on this issue in France. There were short interviews with Roma who were French citizens born and raised in France (they went by another name than Roma which I don't recall now) and they were upset at being lumped in with the Roma allegedly illegally in the country from Eastern Europe. Today there was a news report on NPR reporting on President Sarkozy's ordering "the expulsion of illegal Roma and itinerant immigrants and the dismantlement of their camps." So this week the distinction is being made this action is to deport illegal immigrants. Although I don't share the views of conservative Republican in my country, I can see why they are so frustrated and outraged about the US state and federal governments not successfully enforcing immigration laws in the US (the problem being, as I understand it, the wink-wink nudge-nudge with for a cheep labor pool for businesses who profit from such illegal arrangements. With France's unemployment rate and possible economic issues of social services costs paied from tax dollars, it seems President Sarkozy's enforcement of French law to remove people who are illegally in the country is part of his job description. This is what I understand conservative voters in California, a nearly bankrupt state, wish would happen there, but the illegal immigrants there aren't as easily identifiable a target as the Roma with roots outside France. If the Roma from elsewhere are on the main not taking jobs from French people, only begging or making work for themselves, I wonder what the justification might be other than political gain. I'd like to understand this issue from the French perspective. It is a very interesting article and suggests that the Rom expulsion may only be a political ploy to take away any focus on the forthcoming Grève Générale on 7 septembre.